You can download a template of lined essay paper to practice writing under test-like conditions. 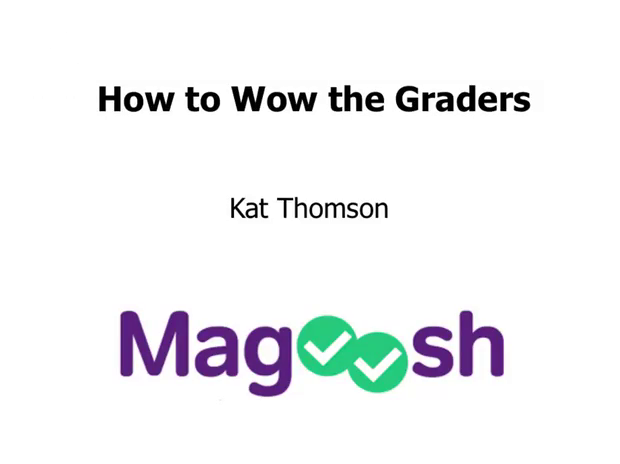 How to Wow the Graders. What is impressive to these graders? And actually the answers might surprise you. They're a little more mechanical and less dramatic than you might assume. Let's take a look at a list of tips I have here so that you get a better idea of what it is I'm gonna be talking about. And I'll say that I would give you a very different lesson if I was telling you how to wow your college professors, whole different story. ACT essay graders are not looking for original creative views. I mean, creativity is nice, they probably will appreciate it, but it's not going to count for more points in and of itself. Let's look at what that ACT is not going to reward you for. Depth, riskiness, artistry, passion, courage, original thinking. It breaks my heart to do this and I'm sure it break some of their hearts when they have to give people low scores who are exhibiting these great traits. But that's not what this whole assignment is about. So those skills will be great for you in college, I guarantee it. But this is about getting really, really solid on the structure, the structure of an essay, the structure of an argument. These are the things that will give you top scores. You want to have a clear argument, use specific examples, have thoughtful transitions, strong analysis, find flaws in opposing arguments and basically write a lot. Have a Clear Argument. Your thesis statement (your argument) should appear where graders expect to find it, which is at the end of the introduction. So let's say that the assignment is to write about intelligent machines. And our student, Cory, is on top of the game and plunks it right there, end of the first paragraph, perfect. First part of mission, accomplished. Now let's take a look at the example and evaluate Corey's argument. Intelligent machines are changing our world, for better or worse. That sentence is not a strong argument. It's more like a sentence that would come at the beginning of a paragraph, but even then if I were advising Corey I'd say don't use this sentence. Let's just kind of give it another go here. Why? Well, for one it's too vague. They're changing our world. Isn't everything changing our world? And what is the for better and/or for worse? Which one are you gonna be talking about? For better or for worse? And what is better, and what is worse? What's the goal? Luckily, Cory comes up with a better option. Although intelligent machines improve efficiency and prosperity in the workplace, the toll they take on relationships is not worth the monetary gain. Great, this is clear. And if you want to learn more about how to construct strong arguments, strong thesis statements, watch our lesson on thesis statements in particular. The point here is that with this wow factor, number 1, if you don't have a clear argument you're not going to get a high grade. You will lose your grader very early on. They'll try and give you the benefit of the doubt, but you've lost legitimacy and you've lost the momentum of your essay, if you don't have a good thesis right at the beginning. Number 2, use specific examples. How does this look? Machines make our lives easier by doing everyday tasks that normally human beings have to do. Well, I mean it's all right. I would say, you know maybe for that kind of early high school early example of coming up with a statement, it's not bad. But it's not showing that kind of college readiness. For one thing, I don't get a picture in my head of any kind of example of what's going on. What are these everyday tasks? Remember, these graders, they're bored, they are reading a million of these things. Give them just something kind of to visualize. Example 2-B. Self-checkout machines at grocery stores can save the typical 4-person family several hours over the course of a year. Now this gives the grader something to think about and maybe even ponder. They might ask themselves actually I wonder how much time would be saved in a year if it's ten minutes a week. That's interesting. That could be like, I don't know what that would be, eight hours a year. And also you are just getting a visual. You are kind of thinking about, yeah, checkout machines, I just went to Target the other day and I was doing that. It creates a connection, it gets your reader on board. You can even get more specific and talk about maybe a particular scenario that happened at your local grocery store when maybe checkout machines were first installed. Stories, specific examples. Those are great as long as you don't go off on too much of a tangent or talk too long about one given story. In an ACT essay, the ideal story is, in my opinion, about four sentences. And you want lots of detail packed into those four sentences. Specific dates, times, places, names. Let's look at a case where a specific example is at the upper limit of how long a single example might be. Let's read this here, or you can fast forward if you don't want to hear me read it. In the 15th century, the introduction of Gutenberg's printing press kicked off a Printing Revolution that drastically increased the production speed of printed text. It used to take several days or weeks for scribes to hand copy a single book. Despite this success, there were still individuals that touted the horrors of the printing press: it would make monks lazy; it would diminish the art of writing. Today, we hear similar sentiments of fear about new technologies. Perhaps people will always be scared of a changing world. Whoa, so don't be intimidated. Okay this is one of those cases probably where a student just learned about the printing press in history class and was tested on it. It was fresh in their memory. And they thought wait, this is perfect. I can bring this into the ACT essay. And you too can draw on recent knowledge or topics that you know well, highly encouraged. Now, this example, I mean it's kind of dry but it actually does have like a little bit of personality, right? Has a little bit of style, and it's very specific, it's making a point. The example you can tell it is supporting this last sentence, which is that people might just be scared of change in general. From what I've seen, it definitely appears that a couple of extended good examples are getting higher scores these days. So if you can do that, you're probably going to wow the graders. And what did I say before? Four sentences is good. What do you have here? There are one, two, three, four five. Number 3 ticket to wow is thoughtful transitions, in addition, on the other hand, and yet, for example, similarly, and most importantly. Transitions do a great deal to help readers understand the connections between your arguments. You can do that with these signal words. You can think of them as being that. Don't assume that the graders reading your essay in a minute or two, that they're going to take the time to infer your logic. And the faster the grader is grading, the more of these you need. A clear example does not speak for itself. I need your help, your interpretation, don't leave that entirely up to the reader. So let's go back to our example of the printing press. I've eclipsed it a little. So our writer gave this example and had kind of like a nice little concluding sentence here but it isn't enough. There's no link to an argument. There is a nice idea here. People will always be scared of a changing world, but that's not quite an argument and we're not looking at that we're looking at something just slightly more specific, its more about technology. The author's trying to set up an argument about machines and technology. So how might they connect this example to some kind of argument through analysis? Well, let's look. Immediately after this sentence, the author adds this. Fear alone is not a valid justification to inhibit new developments. We must be cautiously open minded, carefully consider the pros and cons of each technological advancement before okaying it. So this is their argument then, we need to consider the pros and cons. We have to be open-minded about new technology and also cautious. I do think this is a pretty important point. So strong analysis, what is it doing? What it's doing is it's taking your very specific example, adding a little bit of extra words and thoughts and interpretations, implications, that link it back to your thesis. A strong analysis is like a bridge. It helps you link a specific example to your overall argument or thesis. Number 5, Find Flaws in Opposing Arguments. What does that mean? Well your essay task is to state your perspective on a topic that's given to you and then discuss it in relation to at least one other perspective. But you can't really defend your own very well if you don't find flaws in opposing arguments. What that means is, for one, you do not want to agree with multiple perspectives on this assignment. Let's see what it looks like if a writer tries to agree with two or even three perspectives. Example, machines can be bad because they cause us to lose basic courtesy towards other people. On the other hand they also lead to a more prosperous world by improving efficiency. Perhaps most importantly, machines are good because they help us imagine new possibilities for the future. What's wrong with this? The author basically has taken three perspectives and summarized them. They're bad. They're good. I don't know. Perspective one, perspective two, perspective three. It's going to be very difficult to support this stance because it's all over the place, and I know some of you are probably thinking, but this student isn't agreeing with everything. They did make it clear that they're most in favor of the third point. Machines help us imagine new possibilities for the future. Maybe that's what the student believes. Maybe the student does agree with all three and just kind of likes the third the most. Why is that so wrong to put into a thesis statement? Sadly, the essay task isn't really about conveying what's the most true for you. I do encourage you to say what you believe, for sure, but once you decide what you're going to say, you have to start finding ways of supporting your view. And most students will choose to argue against something, because, frankly, it's a little easier. Okay, so let's look look at these perspectives broken apart. Let's say you want to agree with two. Machines lead to a more prosperous world by improving efficiency. Okay, well what would an opponent say to that? Why might somebody disagree with that view? The way we start thinking about that is we ask ourselves what does an argument fail to consider? What might somebody else say about my argument not considering? And a counterargument to mine, what are they not considering? Machines have the potential to make our world more efficient, streamlined, and prosperous than ever before. It is understandable that people are concerned about the present-day tragedy of lost jobs as computers and robots take on a larger share of the work that used to be performed by humans. What many fail to see is that new technologies facilitate the very types of communication and education we need to create a more economically equitable, sustainable world based in social services. So this person is anticipating others might disagree with this because they're concerned about the loss of jobs. Okay so how am I going to argue against that point. And this would not be enough. At this point the person would need to say a little bit more about okay let's think of an example of that. And number 6, Write a Lot. Make sure your essay is long. There is an unconscious bias toward long essays. I've seen this and so have most of us who help students prep for tests. You don't have to have a super long essay but it's statistically likely to improve your score if it's a little bit longer. Short essays rarely contain the depth of analysis that graders are looking for. But remember, you dont have to repetitive or go off on tangents. You can make your examples longer by turning them into little stories, like I showed you, and you can also increase that analysis aspect at the end of the story and thats where you link your example back to the thesis. When you do this, you are going to come up with really long body paragraphs, and those are great ways to up your essay length. I have here, Aim to get your writing onto the second page of the test book. And of course everybody has different handwriting. I would say if your handwriting is very small, you want to just get probably to the top of the second page. If your handwriting is very large, I would say you probably want to get a little bit into the third page. The average student, maybe a page and two-thirds. And there is a PDF link below this video so you can print out this paper. Okay, so a recap, and remember, these are strategies discussed in other lessons in more detail. So if it felt like we just barely skimmed the surface that's because, in a lot of ways, we did. Have a clear argument, use very specific examples. Thoughtful transition phrases. Have strong analysis. Find flaws in opposing arguments and write a lot. These are things you can do on test day that have been shown to make the biggest difference in student scores.